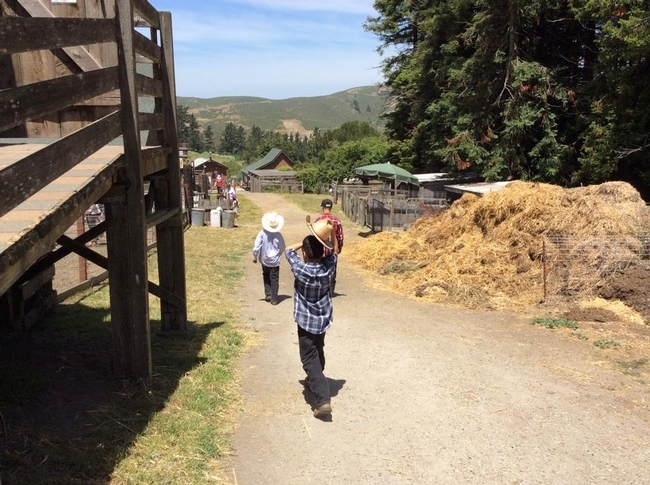 The ranch was donated to UC in 1975 and hosts more than 6,000 youth and adults from all over the San Francisco Bay Area each year. UC ANR presents 4-H programs at Elkus Ranch for children from preschool through high school to explore the processes of producing food and fiber, nutrition programs, community service days and special events. The site is also available for daytime retreats, meetings, workshops, weddings and other special events. Elkus Ranch director Virginia Bolshakova send a request for qualifications to area planning firms which are due this Friday. The proposals should include potential project scope and plans for improved overnight accommodations, new field laboratory areas and new walking trails. Program coordinator Leslie Jensen took the reporter on the tour of Elkus Ranch's facilities and shared the staff's vision for improvements. The staff envisions adding yurts for student housing or replacing or renovating the building where students currently sleep. The ranch's water system is also in need of updating and the staff wants the education center to be "greener." The study is to be completed by Sept. 1.